Clementine is the realistically charismatic star of Sarah Pennypacker’s Clementine series. 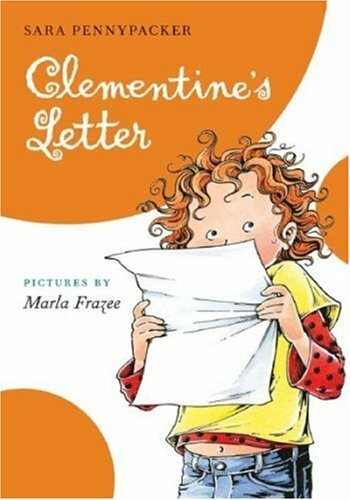 Clementine’s Letter is the third book in the series, and it is chock full of giggling moments. As an adult reading this book, flashbacks to your childhood are bound to happen and the feelings you felt at that time will likely resurface, proving that the main character, Clementine, is very believable. Clementine is just getting the hang of the third grade and her teacher, Mr. D’Matz, really understands her. One day at school, she receives bad news; Mr. D’Matz has been nominated to go on a research trip to Egypt. Now she will need to learn to cope with a substitute teacher and a new set of rules … unless she can figure out a way to stop her teacher from going to Egypt. The main plot of the story is intertwined with her family life, which is both comical and reassuring. This book is great for anyone with a sense of humour, and especially for children who tend to be a little different or have trouble adjusting to change. A link to leave you with (which I found via a post made by Franki, from the blog A Year of Reading) … 10 Reasons for Loving Clementine written by Bill at Literate Lives. Oh, how I love Clementine. I’m looking forward to reading this one. Thanks for the review! You’re welcome! Let me know what you think.